Membership: A Memory For World AIDS Day - Joe.My.God. ABOVE: At the 1985 Xmas party described below: Me, Michael, and Barney. Originally posted May 2004. Reposted for World AIDS Day. We were at his annual Christmas luau party. Tons and tons of people in the house and the backyard. Standing in his kitchen, wearing a grass skirt and a ridiculous Santa hat covered in sequins, he was acting like always…all flamboyant and silly and adorable. My boyfriend Ken and I stayed until the end of the party to help clean up. I busied myself in the kitchen, washing glasses and cleaning ashtrays. Through the kitchen window I watched Ken and Michael in the backyard where they were stacking up the chairs and dousing the dozens of tiki torches, the trademark of Michael’s party. When we were finished, Ken and I stood for a few minutes on Michael’s front porch to review the party: who came, who didn’t, who shouldn’t have come. Ken shot me a scowl. We giggled and waved and headed down the driveway. When we reached our car, I looked back at the house. Michael was struggling with the garbage cans, then broke into a hacking cough. “He’s FINE!” Ken cut me off. Ken knew what I was talking about, even if we didn’t actually talk about it. For two years, maybe three, we’d been following the developing story about AIDS. At first, the press was calling it “gay cancer.” Then GRID. Gay Related Immune Disorder. Then AIDS. We lived in Orlando. Almost all the cases were in New York or San Francisco and that made us feel safe in a strange way. Neither of us had been in either place, except as children. And we didn’t have any friends from either city. Then Miami began to report cases. Michael just smiled and blew us kisses from across the room and limped out. A few weeks later Ken called me from his office. He was going to take Michael to the hospital. His hip was terribly infected and he couldn’t walk. I didn’t ask Ken what was wrong, by then we knew. And Michael knew that we did. Waiting for Ken to come home, I watched a TV report on AIDS. Specifically, it dealt with how funeral parlors were sometimes refusing to handle the bodies of AIDS patients. Fear of infection. Fear of loss of reputation. The narrator made a comment about the families and friends of those killed by AIDS. He called them “this new and modern group” of grievers. When Ken got home, I told him about the story with indignation. Over the next few months, Michael was in the hospital quite a bit. Ken got into the habit of visiting him on his way home from work, something I could rarely do since I worked nights. When I did see Michael, he looked progressively worse. Skinnier, more pale, his skin patchy and scaley. But he always had that bitchy sense of humor and that chicken cackle. I’d hear that laugh from down the hallway as I approached his room, which always seemed to be full of friends. Florida started its state lottery that summer. On the first night of the big drawing, I tried to stay awake for the results but I fell asleep with the tickets in my hands. I was awakened by Ken sitting on the bed. “Hey.” I rolled over and looked at the clock. Three in the morning? Ken still had his tie on. My throat clenched. I don’t know why, but I pushed the lottery tickets over towards him. Ken leaned over and started untying his shoes. He pulled them off and finally turned to face me. He looked so very tired. He laid down next to me and hugged me, then spoke softly into my ear. BELOW: Barney died four years later. 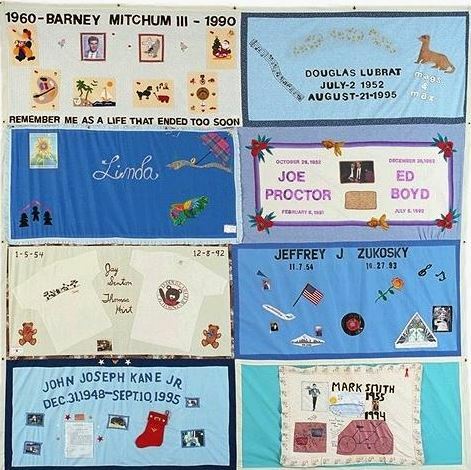 Here’s his NAMES Project quilt panel.